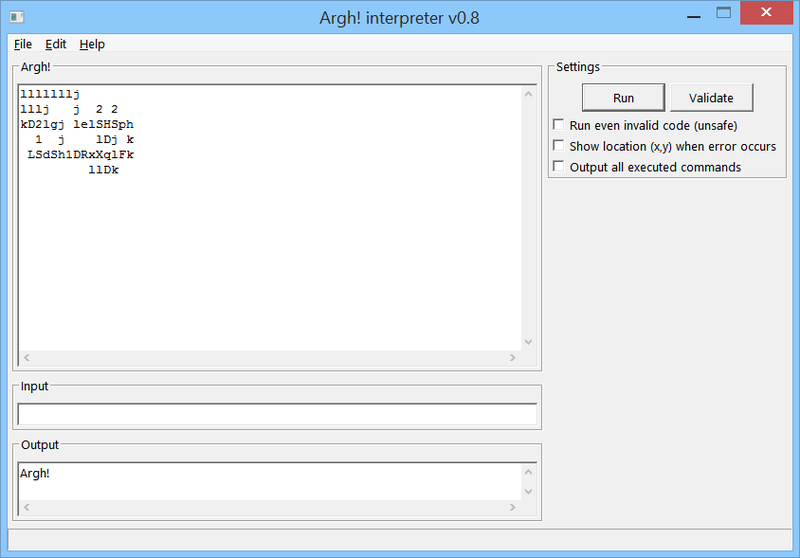 An interpreter for the Argh! programming language in wxHaskell. Argh! is an esoteric programming language created by Sascha Wilde. An Argh! program is a two-dimensional grid (80x40 cells) and each cell contains an integer that can be interpreted as such or as a command that can be executed. A stack is used to store values and to do calculations. For more information about Argh!, see Esoterisches Hacken (in German) (automatic translation to English). The package can be downloaded from Hackage; the command cabal install arghwxhaskell produces the executable argh. This page was last modified on 3 December 2015, at 15:40.